Tammy Grogan and Associates is a family of real estate professionals excited to help you take the next step in your life. As a native Ohioan, I have raised a family in Stark County, and love calling Ohio my home. These deep ties to our community are what drive my team and I to help you find the house of your dreams! Over my 29 year career, during which I have served thousands of clients, I have cultivated an extensive knowledge of the North East Ohio area and a broad network which my team and I use to your advantage. This in-depth understanding of the area and passion for our clients set my team and I apart. We are dedicated to you as a seller or buyer and go above and beyond your needs to ensure you receive the best service possible. As a seller, Tammy Grogan and Associates can help you sell your home for maximum value. We are also committed to helping our buyers find their perfect home in a community they love. Through my unparalleled industry knowledge, leverage of trade tools, and tireless commitment to my clients, I have continued to be one of the top agents in Ohio. I am listed in the top 99.7% of all registered agents in Ohio for sales and the recipient of the Pinnacle Award for sales volume. I have also been named Cutler Real Estate’s #1 Sales Producer in Ohio. In assistance to our clients, Tammy Grogan and Associates service Stark, Summit, Portage, Tuscarawas, and Wayne counties. Feel free to visit any of my pages, or contact me or my team to learn more! No matter your needs, my staff and I are here for you! Happy house hunting! We cannot say enough good things about Tammy! We met Tammy over 12 years ago when looking for a home in North Canton; Tammy matched us with a home that was perfect for our family! We recently had to sell and relocate due to my husband’s job- we knew, without any hesitation, that we wanted Tammy as the listing agent for our home. Our home sold in 6 days for the full asking price thanks to Tammy’s hard work! Tammy has made the process of buying and selling homes so easy for us. Tammy Grogan and her team of professionals are excellent! They worked hard and sold my home very quickly. Tammy made a very hectic time easier to handle! Tammy was very open and upfront about the all aspects of the selling process that I had never dealt with, so it was a very easy decision to have Tammy and her team (especially Fran Mucci) help me find my new home to purchase! If I were to move again I would call Tammy Grogan to sell and purchase my homes! Tammy and her associates were professional and knowledgeable throughout the selling process! Tammy was great at communication and always responded quickly. She was adept at pricing, marketing and negotiations. Our house sold within 1 week and we couldn’t be more happy with our selling experience! Hi Tammy, just wanted to say what a great job Jen Zeiger did as our realtor in buying our home in Uniontown. She was a great help and encouragement throughout the process, being available whenever we needed it, and took special effort to provide the information and persons necessary to complete the transaction. She was fun to work with, knowledgeable, and we are so very thankful. We wish you and your team much success, and God bless. 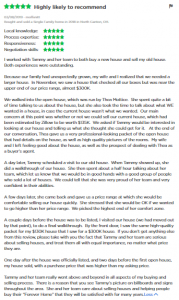 Although the property took a while to sell, we were very pleased with Tammy and her team. We never doubted that her team was giving 110% effort and know that no one else would have sold the property for more money or any quicker! I recommend Tammy Grogan and Associates without reservation. I had listed my home with another agent and company and had no offers after 90 days. I then did some homework, and the obvious choice for a listing agent in my neighborhood was Tammy Grogan. I closed on my house with a cash offer a little over 5 weeks after calling Tammy Grogan. I cannot say enough about her entire team. Listing information © 2019 NEOHREX Multiple Listing Service. All rights reserved. The data relating to real estate for sale on this website comes in part from the Internet Data Exchange program of NEOHREX. Real estate listings held by brokerage firms other than Tammy Grogan and Associates at Cutler Real Estate are marked with the Internet Data Exchange logo and detailed information about them includes the name of the listing broker(s). Information Deemed Reliable But Not Guaranteed. The photos may be altered, edited, enhanced or virtually staged. Data last updated 2019-04-23T19:07:17.363.